↑ ୧.୦ ୧.୧ Garcia, Mark (1 October 2015). "About the Space Station: Facts and Figures". NASA. Retrieved 2 October 2015. ↑ ୨.୦ ୨.୧ ୨.୨ ୨.୩ ୨.୪ ୨.୫ Peat, Chris (25 January 2015). 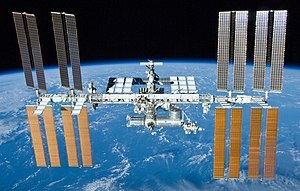 "ISS - Orbit". Heavens-Above. Retrieved 25 January 2015.